Are you much of a couponer? I’m trying to learn more about it without spending tons of time scouring newspapers for coupons that in the end, don’t add up to compensate me for the amount of time I spent searching for them then cutting out the coupons. Let’s just say I’m loving the idea of online coupons, including manufacturers coupons. Well guess what? Kraft and Walmart are teaming up to provide #PackedWithSavings and they’ve asked me, through #CollectiveBias, to share it with you. Seriously, check these out. 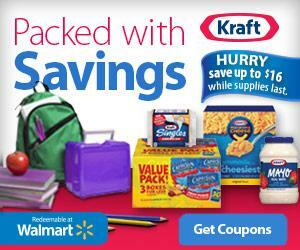 More than $16 in savings and the coupons are all in one place! Share these online coupons with your friends!